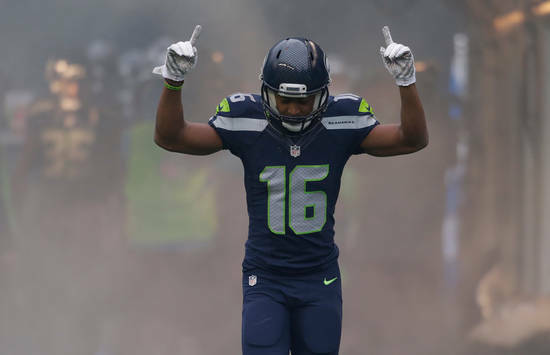 The Associated Press and NFL Pro Football Focus named former Booker T. Washington standout Tyler Lockett to their 2017 All-Pro 2nd team. As stated by Pro Football Focus, the race to be our top returner came down to the wire, with Seattle Seahawk WR Tyler Lockett almost stealing the show with a huge week 17 performance. Lockett ended the season leading the NFL in kick return yards with 949 on 37 attempts, averaging 25.65yds per attempt. He was also 4th in the NFL in All-Purpose yards with 1,799. Lockett set a record this year with his five (5) kickoff returns for 197yds against the Atlanta Falcons for the most yards recorded since the NFL rule change on kickoff returns. The NFL changed the touchback rule last year in an effort to cut down on kickoff returns. Lockett was named Special Team Player of the Week after the Atlanta game. In week 17 against Arizona, again Lockett recorded 156 kick return yards on four (4) returns. In addition to his kick return heroics, Lockett also had an impactful year receiving. He had 45 receptions, for 555yds and 2 touchdowns. In Lockett’s three (3) years with the Seahawks, he has amassed 5,274 All-Purpose yards, 137 receptions for 1,816 yards and thirteen (13) touchdowns. In 2015, he was named 1st team All-Pro and 1st team Pro bowl by the AP. In 2016, he was named 2nd team All-Pro by the AP, and named as a Pro Bowl alternate. In 2017, he was named 2nd team All-Pro by the AP and PFF (Pro Football Focus), and named a Pro Bowl alternate. Tyler will be entering his fourth (4th) season with the Seattle Seahawks in 2018.